For the life of me I cannot recall where I got the card front for this. 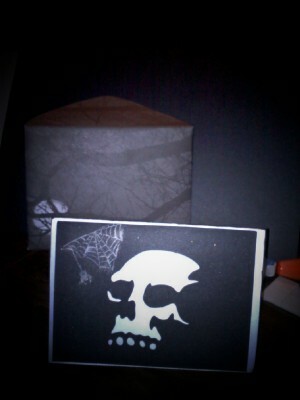 It came in a set of three card fronts (the ghost, the skull and house both shown below). If anyone knows where these are from I would appreciate you letting me know so I can give credit to them for these card files! I cut the front out of orange card stock and then chalked and glossy accented the ghost. As I started to ink the edges of the orange card stock my three year old bumped into me and I smeared black ink across the front, so I just added more smears LOL. A few blings to the front and I was happy with it. 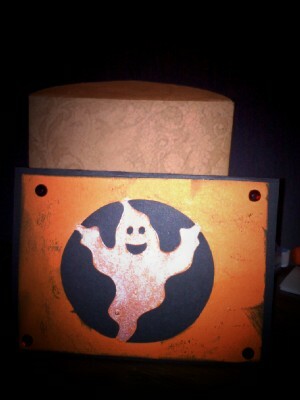 Inside of the Ghost card is the "Boo" pop up from SVG Cuts. This is part of their Premium Pop Up Cards collection! The cat stamp at the top is one I picked up in a set of clear stamps at Joann's. 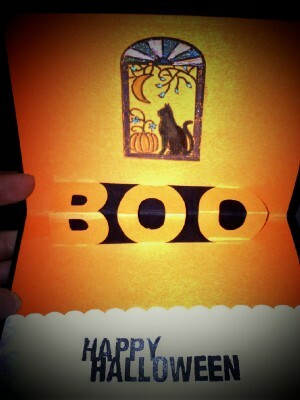 Again this came from the trio of card fronts that I cannot recall where I got it from. I love this card front. 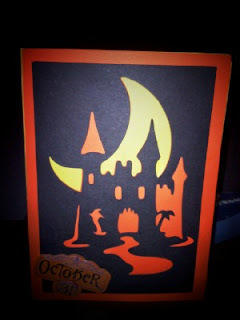 Simply cut out the main part in black and the moon piece in yellow and adhered to an orange card base! 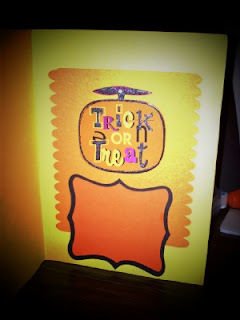 A simple pop up sticker "October 31st" and ta da! Inside of the haunted house card is a simple dimensional sticker and scalloped frame to write on. Inside of the skull card I used yet another file from SVG Cuts . This is a simple oval pop up from their Premium Pop Up Cards Collection. If you haven't checked these guys out you sure should. All their files are in SVG but they seperate everything so you don't have to do any breaking apart or such if you are a Make The Cut software user like me! 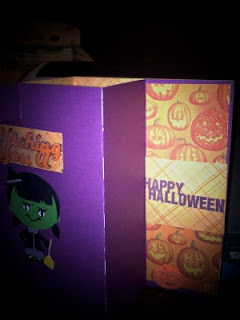 And here again is another card base from SVG Cuts. 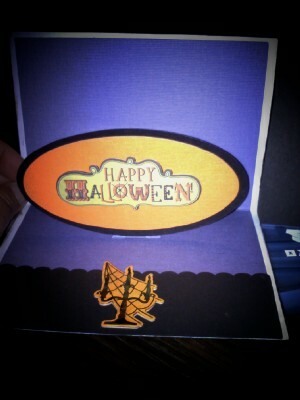 This time I used one of their Breezy Backyard Lever Cards set. 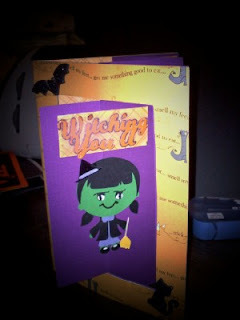 The cute witch is from Rob over at Scrappy Dew . I made the "Witching You A" in MTC. If you want a file of the text let me know. I threw on foam stickers of a bat and a cat to finish off the front. Added some halloween paper from K&Comany and a couple of foam pumpkin stickers to finish it off. Thanks! Ontario is a small town but it's a nice town for the most part! Small world huh?